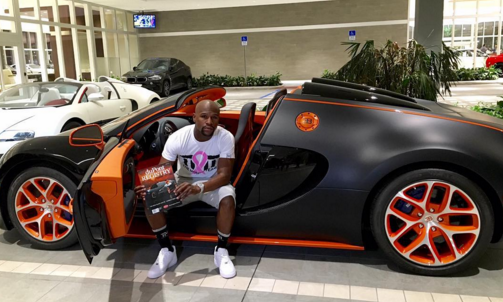 After hanging up the boxing gloves in September at 49-0, Floyd Mayweather is still the king of bling. The now-retired TBE showed just how much cash he still has in the safe, dropping $3,498,000 (£2,280,000) on the new 2015 Bugatti Veyron Grand Sport Vitesse. According to the official Bugatti website, the car goes from 0-100 km/h in 2.7 seconds, with a top speed of 407 km/h. Sheesh.